This week I had the opportunity to visit the Art Gallery of Ontario (AGO) to see the Picasso Exhibit. It showcased a large collection on loan from the Museé Picasso in Paris. My friend Ann and I arrived early to enjoy the exhibit without the distraction of large throngs of people. Apparently, others also took the same early-bird strategy and the rooms began to fill up within 20 minutes of our visit. Having these people around me made a great difference. I learned that visiting an art gallery is both a personal and a communal experience. What dumbfounded me the most was the stripe and flavour of the crowd, who were mostly elementary school children. There were at least three different schools visiting the exhibit. 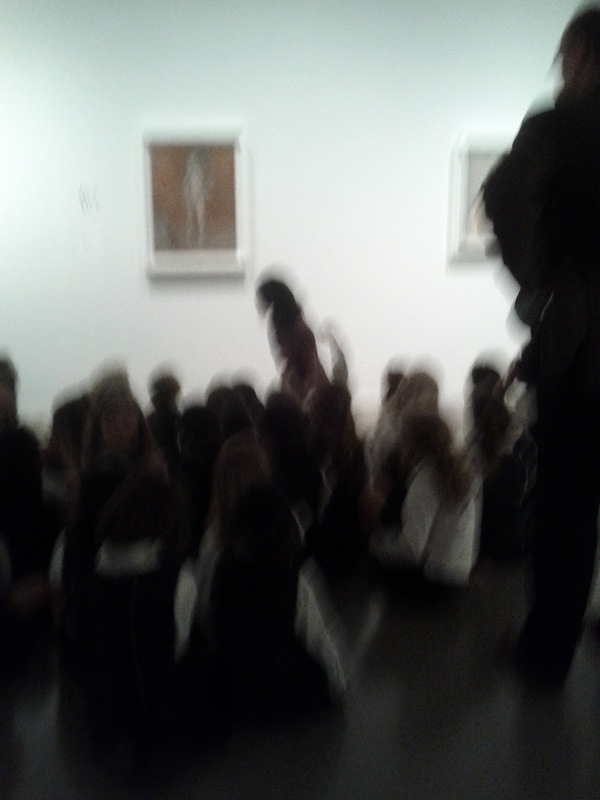 The blurry picture shows one of these groups before a Picasso painting, as the tour guide asked them for their opinions. I am all about enabling children to engage with a gallery's collection and major exhibitions, but somehow I felt this one was a bit outlandish for them. The display was very well curated and thoughtfully presented, but the subjects were not exactly what I would show to children in their age. 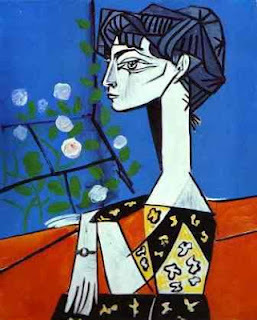 Picasso was an avid womanizer. His relations with his various mistresses and wives sometimes overlapped; some were private and others public. Many of the portraits – at least a good 40 percent of them — are of his wives and mistresses. The painting the children were looking at was a depiction of Fernande Olivier, his first long relation, one of the main subjects of his Rose Period paintings. Having said that, I found the interaction between the children and the tour guide fascinating. I could not help myself, and I actually stopped many times to listen to their exchanges. I kept waiting for the guide to ask them, “Well, children, why do you think this woman is naked?” She never did. She engaged them in other ways. Rather, the guide asked them about what they found fascinating; about the colours, about the style. She asked them how they felt when they looked at a specific painting. I had forgotten that art is about personal interpretation, and the interpretation of a child is as valid as that of an adult. The conversation between the guide and the children taught me that. I was too concerned with how I felt about the exhibition – ''There are too many nudes'' – and I allowed too little room for other interpretations. In the end, the visit helped me to recognize that we are drawn to art in many different ways, and there is always a spiritual connection with everything we engage with. Art, like spirituality, is open and dynamic. It is a way to experience and think about the world, and the way I engage with a specific artwork speaks about the way I find divine life at the depths of reality. Art is a powerful experience because through it a “space of interiority is opened where God works in us, and we are able to see the world as a place in which God is at work” in us (Jesuit General Congregation 35, Decree 2, No. 8). The children were able to find that space through colours, shapes and styles. They did it while paying attention to their feelings and emotions. I did it by entering a conversation with the styles and subjects of the paintings, but most importantly by paying attention to the way others engaged with the same works of art. I already know that we can find God in all things; but to arrive at such an experience in different ways, this is something new for me.